to their knees begging for forgiveness from the beast. Chances are, you’re somewhere between the two. You probably heard about the potential in real estate investments from family, friends, colleagues, or by your own research in observing other wealthy individuals and how real estate has played a part in their success. Either way, you’re here now, so you have some level of interest or involvement in using the market to make some extra spending money, or creating a safe and sound retirement plan. The potential in rental properties and creating steady cash flow for you and your family is endless. If done right, you have the power to set yourself up to get paid just for waking up in the morning. Let’s take a look at the necessary steps to finding the right property to purchase, and how to repeat the process to set up a retirement plan that will let you spend your time on the beaches of Costa Rica. As we move along, these two generalizations will make more sense, but don’t ever lose sight of these. The use of a property management company is key to doing rental business in other cities and states. A company with great customer service and business practices will allow you to take advantage of markets near and far. Bottom line, a property management company is a must for anyone with a large portfolio of rentals and any successful investor will agree it is worth the extra cost as it saves them time and money in the long run. Lesson learned: my property can be anywhere thanks to professional management companies. This can be a pretty complicated subject, but let’s attempt to keep it pretty simple. There are a few basic traits a local market must have to be considered a good place to invest in rentals. The best way to figure this part out is to consult with a local real estate professional and run them through these market traits to see if the subject city is in fact a good choice in investment. The first trait is incredibly important. The subject city has to be a bedroom community. This term describes a city that is made up of average sized single family homes, condos, or multi-family units where the working class lives, not works, hence “bedroom vs. business”. The people who can afford the nicer houses in the business section, or the expensive downtown high rises are most likely homeowners, rather than renters. This is a demographic of the market that has the financial ability to own a home and build their own equity rather than spending their money on disappearing rent payments. The last thing you want to do is purchase a nice place in the business section and are stuck unable to rent it. Local professionals will certainly help you determine the hot places for rentals, but this is a good general concept for your own knowledge. 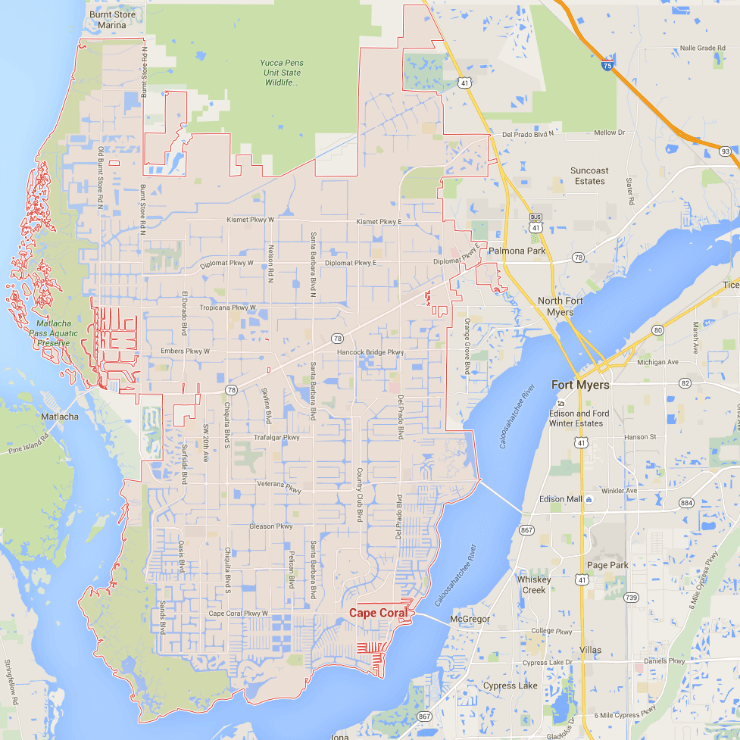 As an example, let’s take a look at the map of Cape Coral, Florida and Ft Myers, Florida. The big section of land in the middle marked in red is Cape Coral. The right side of the image, on the right side of the blue water, is the city known as Ft Myers. The two cities are connected by four main bridges that give access to the northern, middle, and southern sections of the cities. Looking at our market trait of bedroom vs. business, Cape Coral is known as the bedroom, and Ft Myers is known as the business. The easy breakdown is the masses live in Cape Coral, and work in Ft Myers. If you have an IQ over 50, it’s pretty clear that Cape Coral is the right city to invest in. It is almost all residential property containing the average single family home that renters are seeking. It is one of the most perfect scenarios for investors seeking an opportune market of bedroom vs. business. When you’ve found a location you like, you have to find out if it’s the right time to purchase. If you’re entering in a buyer’s market, it means you are going to pick up the property at a lower than normal price, and vice versa with a seller’s market. Consulting with a local real estate professional is a key move here. They can provide you data for their current market. Get a feel for what houses were selling for all the way from a few years ago, up until current day sales so you can see the general movement of the market. If the current sales on comparable properties are higher than any other point in history, it’s not the right time to buy. If the current sales are comparable to what they were 6 months or a year ago, and the sales prices are falling, your are probably in the buyer’s market territory and can feel good about your purchase. There’s two types of buyers when it comes to purchasing an investment properties: those who buy on emotion, and those who buy based off numbers. Hopefully you’re the latter, or can learn to be. The whole point of growing a portfolio of rental units is to create a consistent and lucrative cash flow, and buying properties that can produce those magic numbers are a major part of this puzzle. One of the biggest methods used by investors to determine a property’s potential is running a basic cap rate, otherwise known as the made over paid method. It’s actually pretty simple. Let’s look at an example. Let’s say Sarah buys a property for $150,000 and rents it out for $1,300 a month. We multiply her rent by 12 months to find out she made gross $15,600. Now let’s subtract her management fees, insurance, taxes, etc and assume she nets $13,500 per year. Now we take her made/paid, 13,500/150,000 and see she has an even 9% cap rate. This is considered an excellent deal, as she is making 9% on her money, annually. There are varying opinions on what percentage makes for an acceptable cap rate. In general, anything from 6-8% is good, 8-10% is great, and 10% or higher is unusually high, but amazing. The greatest thing about investing in rental properties is you’re purchasing properties based on their cash flow abilities, not the ability for it to appreciate. This is a critical difference that seasoned investors have picked up on, as buying on the speculation of appreciation is like heading to your local casino after telling your wife “there’s a really good chance I’ll win”. Appreciation is a great thing, don’t get us wrong. The problem is when investment groups, real estate agents, or any type of professional in the business tries to sell you on the idea of appreciation. Can the market keep going up, and up, and up, or does it eventually crash and reset? This is where so many people lose themselves in real estate. In the opening of this article, two types of people were mentioned: the great and powerful who made it in real estate, and those on their knees who want a second chance. This is where that differentiation is made. Yes, there are a lot of people who made a LOT of money with appreciation, but we’re talking about long term, healthy, and sustainable wealth. Remember earlier, the more the merrier, and don’t put all your eggs in one basket? Let’s talk about why that’s so important now that you have a basic understanding of how this works. Once you have your first property like Sarah did in the example mentioned earlier, you have a nice 9% return on your money. Her mortgage is probably right around $900, leaving an extra $400 a month for extra income. What happens if she doubled this, tripled this, or did it another 20 times? It’s not impossible. Of course, the current state of financing will influence how many additional properties you can purchase, how many assets you have, savings, cash flow, etc. The point is, the more properties you acquire, the higher your monthly cash flow, and the more properties are sitting their paying themselves off. Since we mentioned Cape Coral, Florida earlier as a golden city to model after, let’s use it again. Rents are historically high now in 2016 and are making a lot of investors a lot of money. What happens if those investors have 100% of their properties here, and suddenly all of the renters were able to purchase their own homes due to an ease in financing requirements? Suddenly, rents shoot down and so do the profits. A great way to diversify is getting properties that appeal to different cultures. Have properties that are expensive and allow for big rental payments every month, and have some that are for the blue collared workers that don’t require big rental payments. It’s a great way to protect yourself from dips in sub markets within a city. Hopefully you feel a little more confident in the big picture of growing a rental portfolio. There are approximately one million questions that can be derived from any part of this process, but it’s important to understand the basics, like anything in life. Your best bet is to have real estate professionals you in all of these steps. Be weary in every step of who you decide to help you. Most people are out for themselves to make a quick buck, so finding trustworthy companies and individuals is key. As a landlord you can achieve the highest levels of success with the help of professionals like the folks at Douglas Realty.